A thing of signs to come! Work proceeds - at last - for the permanent signage at the gift shop and visitors center. More to come. 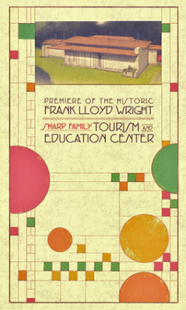 Al Garcia, a producer with Polk County TV has just released his sparkling video and says, "come and encounter Frank Lloyd Wright Architecture at Florida Southern College, which is now a National Historic Landmark. Be intrigued by the interesting history, by inspired by the artistic structures, see and learn the college's unique structural evolution post Frank Lloyd Wright." Taliesin Fellows declare the book "noteworthy"! Nice. The current issue of The Journal of the Taliesin Fellows features a comprehensive look at "organic architecture in Florida" and includes photos of the Florida Southern College campus, an article by Jeff Baker, who was the supervising architect for the Usonian house and is leading the restoration work currently underway on the original buildings, and a cheerful review of the book produced from this blog. Click here for a PDF version of the review. The campus of Florida Southern College in Lakeland -- in the architectural world, it's known as "Child of the Sun." That's the name given to the group of buildings here designed by architect Frank Lloyd Wright. 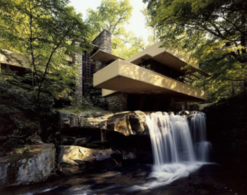 The largest collection of Frank Lloyd Wright architecture on one site, for one client -- 13 structures in all. And while most of them have been here for years, one is new: A 1939 design of a two-bedroom, one-bath home being used as faculty housing. The plans were found in the archives at Florida Southern but it had never been built. "The Book" is now available online. Please take a peek. Leave a comment. The hardcover version will be out later this year. Follow this link. The southern cypress seems to generate a warmth you can almost feel as you arrive. The low, multi-level ceiling of the carport ( a Wright innovation ) offers a cozy refuge and beckons you in. Doesn't it? Wright wanted people to live in his structures, to be "alive" in them, not merely to be present or to just "come home" to them. Unless you deliberately look up, you are unlikely to see or pay much attention to your ceiling, but Wright would have none of that. He surrounds you with the natural elements in all directions. Ledger writer Gary White and photographer Ernst Peters have produced an exquisite pair of articles on the Usonian House and Tom Sharrett whose company fabricated and installed all of the cypress features and accents. The work appears in the current issue of PolkLife. The online versions can be found here and here. We are now acquiring "portrait" images for the book. Each visit yields new instances of the stark and authentic beauty of the construction, its materials and its crafters. More to come. While the roof workers were pressure cleaning the roof we got a chance to see a nifty design feature that we weren't expecting: the roof drain that sits over the planter at the southeast corner of the house. No need for a watering can in the rainy season, eh? It will hardly ever be just another house in the neighborhood, but on this serene, brightly-lit November morning, it seemed to be what Wright intended - a natural part of the landscape. See more in the November Gallery. With the exception of some minor details, the house is now complete, and the principles of its construction are ready to sit and savor the accomplishment. There will be more to do, and there will be adjustments and refinements - more like "polishing" what's already been done. This blog will continue to follow and report on the life and times of the house, but as today's entries are posted in the November Gallery, we too are ready for a brief respite and some reflection of our own. It has been a complete pleasure and a lucky circumstance that brought us the opportunity to meet and come to know such fine and dedicated artisans, craftsmen, and professionals. Next up are an interview with Tom Sharrett, the installation of the last of the glass inserts and more of October's push to the finish. Check back often. Tom Sharrett works on the final fitting adjustments for the bedroom's corner doors. This pair, and two other sets like them, open like the french door pairs but must meet and latch to each other with a highly-specialized design. See more in the October Gallery. The historic bungalow that will become the college's gift shop is being restored to its original condition on the outside, but is definitely taking on a Frank Lloyd Wright look inside. More to come of course, but there's already a lot to see in the October Gallery. The countdown to the premiere has moved inside ten days. It's starting to feel a little like working on an engine while it's running. Details change by the hour. Check the burgeoning October Gallery to see what we mean. Please pardon a brief building-the-Usonian-House-project timeout for news of a buildingtheusonianhouse.com update. As we approach the "premiere" of this amazing undertaking, we thought it would serve us all to refresh and re-construct this site to take advantage of improved technology and experience gained over the course of two-and-a-half years as a "sidewalk superintendent". The photo above was first one taken. We'll be sure to publish one taken from the same location when the house is finally ready for its close-ups. Thanks to all of you who have been "walking along" with us. Here's a brief summary of our improvements: whenever possible, videos have been re-mastered to play in high definition, and some have been re-edited to tell the story better; a lot of "tidying up" throughout the site to make things easier to find and explore; and we've loaded all of the 2011 blog-entry headlines right here on the home page sidebar. The "live blog goes back to January 2012. Please take a thorough look and make sure you refresh the site to avoid visiting a cached version, and if you find a failure or a flaw, please let us know. A lot of people who haven't been watching all of this unfold will be dropping by to see how it happened. We'd like to make that an excellent experience. The tangible fundamentals of Wright's Usonian houses are of the earth, but he clearly wanted to use them to showcase the most important and ethereal element: light. It's almost as if every detail is destined to capture, reflect, or direct light into the windows of every viewer's soul. See more in the October Gallery. The house is now wearing a little protective gear. As the number of workers increases so does the risk of "injury". A tool-belt ding in a door frame could cost a lot of time and money to repair. Stay with us while we watch the frenetic action leading up to the October 31st premiere. See the October Gallery here. All of the crafts and trades were aboard today, sawing, nailing, fitting, digging, pumping, drilling, etc! The deadline for its debut, October 31st, is pushing the work and workers forward at a full but deliberate pace. Check the video here and see more photos in the October Gallery. Eight striking colors, nine extremely precise geometric shapes, and nearly 5,000 perforations to fill mean that Ken Berman and his crew will be on the site as much as possible during the final stages of construction. 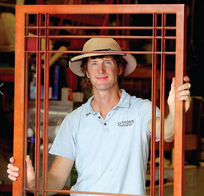 Lakeland is home to Berman's stained glass studio, The Glass Onion, so his commute is an easy one. However, he will have to travel halfway across the state to meet Ron Bearer who fabricated the inserts. Ron considers the delicate "L"-shaped ones too fragile to ship via normal carriers, and so will meet Ken in the middle to make sure they arrive safely. See more in the September Gallery and of course throughout October. The work continues apace and details from the drawings are becoming real, three-dimensional components. This is truly a hand-made house, and while the blocks tend to define it, the wood is warming it up and refining it into Wright's vision and into the essential Usonian construct. See more in the September Gallery. The ceiling planks move smoothly from the interior to the exterior, almost as if the walls weren't even there. The precise alignment and continuity are crucial to the successful realization of Wright's design. See much more in the August Gallery. Work on the gift shop bungalow, the parking lot and the grounds. It doesn't have to just be right, it has to be "Wright". Tom Sharrett works to ensure that all of the ceiling planks line up and match the grid system that characterizes the Usonian design. Like most aspects of the house, the work is proceeding deliberately, but once a part is installed, that's it! Done and done. More to come, and more to see in the August Gallery. Tom Sharrett and an assistant got back into the house today and started putting the ceiling boards into place. Made of the same southern Cypress as the roof trim, the planks have a warm natural glow and an obvious precision, cut to conform to Wright's design. See more as the work moves forward by visiting the August Gallery regularly. Sorry about that. It was a little too irresistible. But the carpenters are happy to be working on the bungalow. The beam will be installed across the front, resting on the two corner pillars, creating a wide open invitation to enter. The house is being expanded to accommodate visitors with restrooms, refreshments, and a gift shop. See it all in the June Gallery. Work continues on "the little green house" which will soon be more like brown or tan. The intent is to restore it to the proper condition of its original era. Authentic style wood siding is being installed and you can see some craftsman-like details emerging in the window framing. See the May Gallery here. What we've been referring to as "the little green house" is being fitted with temporary siding across it's eastern face, while carpenters remove the worn, original siding from the rest. The whole house will be covered in new, historically correct, board siding. The restored bungalow will house the restrooms, gift shop, and refreshment area for visitors to the Sharp Family Tourism and Education Center - the Usonian House. Nice weather means it's nice to work outside. See more in the April Gallery. Street views are updated only occasionally, but the satellites are snapping away and a recent project for students at Florida Southern uncovered this image. The Usonian house is in the upper left corner and is shown with the roof completed. The view also shows the water dome in operation, a lucky shot, because it only runs on a limited schedule. Nice work, Google! The soffitt and fascia are done! There's a little blue tape to remove along the cypress boards, which the roofers will probably do this week. They used it to protect the wood while they were creating the final seal along the edges. Next up, interior fitments, doors and windows, and built-ins. Stay tuned ... and check the October Gallery for more pictures. The rainy days have given way to an abundance of sunshine, and even though the leaves are starting to change in cooler climes, it's still the dead of summer here and hot! The Sharretts are making their way around the roof line, and Wright's vision of how it would be seen from eye-level at the street is coming into view. See more in the September Gallery. Board by handcrafted board, the cypress finishing lumber is being installed, as fascia, soffitt and, as seen here, as a ceiling for the carport. The fine woodworking will continue until the house is complete because it will comprise all of the rest of the major work, including window and door frames, built-ins, shelving, and lighting recesses. See more detail in the August Gallery. From July 27, 2012, to February 13, 2013, the Sackler Center for Arts Education at the Guggenheim Museum will present A Long-Awaited Tribute: Frank Lloyd Wright’s Usonian House and Pavilion. We met the Sharretts today as they prepared to work with the first of many loads of Florida and Louisiana cypress that will be used for soffit, fascia, furniture, cabinets, windows, doors, and ceilings. See a little more in the July Gallery. The house's "flat" roof is really a lot like a shower drain, and each of the three levels is designed to move the rainfall toward copper scuppers (being installed today), that will drop it into a copper "tub" inside the chimney structure. A drain there drops it into a pipe that moves it under the house and into the local drainage system. See more in the June Gallery. You'll also find a tantalizing hint of what's to come for the fascia and soffit. Prompted by a question from a blog reader, we have updated our "Resources" page with plan and elevation drawings, and a note from Jeff Baker regarding the original site plan and its history. Click here to go there, and here for the blog entry comment.